When a player attacks a target of the opposite gender, the player can force the target to make a choice. The target must either discard a hand card or the player to draw one. The attacker forces this choice upon the defender before the attack is resolved. The card will either be discarded or draw prior to the playing of an Escape or taking armor into account. The gender that matters is the identity that each person has selected for their general. It is not based on the gender of the human playing in the real world. Zhang Fei has unique advantage of being able to use the Gender Swords multiple times per turn. People groan when they are forced to deal with the Gender Swords once, but Zhang Fei can punish a female many times in a single turn. If he draws, he may get even more Attacks. This allows him to attack even more. Any female has an advantage when using these weapons. Not because they are more deadly, but because there are usually more men in play than women. This means there will be more male targets so the Gender Swords will be more useful. This weapon is very useful when going after the opposite gender, but has little to offer otherwise. This is used best in the long run, attacking someone turn after turn. At first, they may resent the idea of you drawing and throw off from their hand. After time though, they will start running low on cards from continuously poking them. Then you will start drawing cards giving you more opportunities to cause damage to them. Be sure to protect your weapon though, since the more useful it is to you, the less happy your opponents will be that you have it. The person who wielded these swords is none other than Liu Bei. He had them made alongside his brothers' weapons to support the emperor in suppressing the Yellow Turban Rebellion. There is no mention of them having any special power over females, especially since Liu Bei was not much of a fighter. Many times twin swords are referred to as one being male and the other female. Apart from that, they saw relitively little action at the hands of Liu Bei. Their most famous conflict was at Hulao Gate. When both of Liu Bei's brothers could not overcome Lu Bu, Liu Bei joined in, making it three against one. In time Lu Bu retreated because he grew weary. 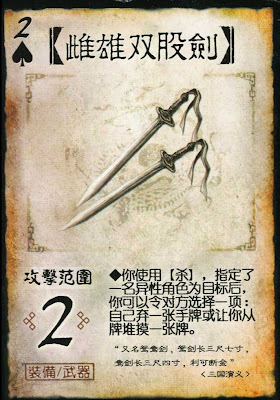 For the rest of his days, Liu Bei kept these swords with him, using them whenever he needed.